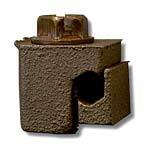 Penn-Union splitbolt connectors are used for bonding copper-to-copper conductors. 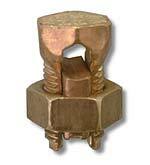 Manufactured from high strength copper alloy, they are highly resistant to corrosion and cracking. The design provides, under torque, high contact pressure between conductors. The pressure bar is specially designed for high pull-out resistance. UL Listed. Penn-Union Vice type bonding connectors are used for bonding copper- to-copper conductors. They provide superior compression and grip and are very easy to install. Manufactured from silicon bronze. UL Listed. Penn�Union insulation piercing bonding connectors are used to bond messenger wire to ground conductors. When the clamp is tightened, the piercing teeth puncture the messengers insulation, forming a positive ground connection. 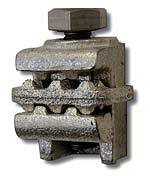 The clamping bolt is stainless steel. The body is manufactured from tin plated silicon bronze. GC167P .146" - .312" .146�.312"
©2004 Broadband Products, Inc. All Rights Reserved.